Fall often becomes the season of indulgence, particularly around Halloween and Thanksgiving. 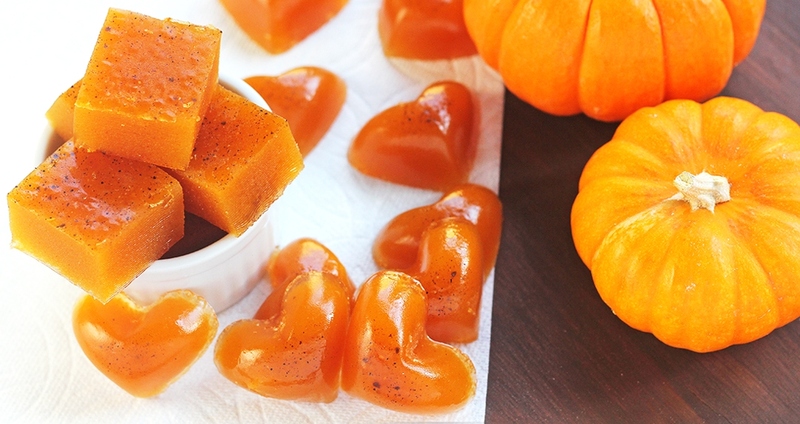 However, instead of loading up on processed treats this season, how about making your own pumpkin spice gummies? These delicious gummies are sweetened naturally with apple juice and are rich in antioxidants, minerals and vitamins. Plus they’re so fun to make that the whole family will enjoy them! Tip: If using candy molds, this recipe will use between 3 and 4 molds (depending on size of the molds). Mix apple juice, pumpkin purée and pumpkin pie spice together well. Add to a saucepan and place over medium-high heat until nearly boiling. Sprinkle gelatin powder over the liquid while continually whisking, and whisk well until gelatin is completely dissolved. Pour into an 8? x 8? baking dish or candy molds. Make sure the mixture has cooled completely (for several hours or overnight) before cutting into squares or removing from the molds. Store in an airtight container. Will keep up to seven days in the refrigerator.